In the Slavic culture, the waffle cake is a very popular dessert. 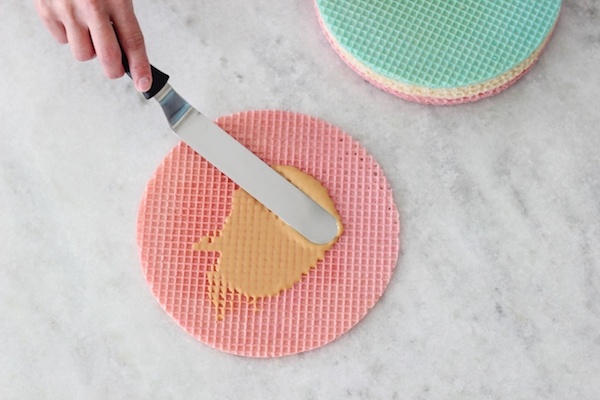 With thin and crisp waffle layers that are spread with a creamy dulce de leche filling, not only is this a delicious combination, it’s one of the easiest to prepare and looks so pretty too. 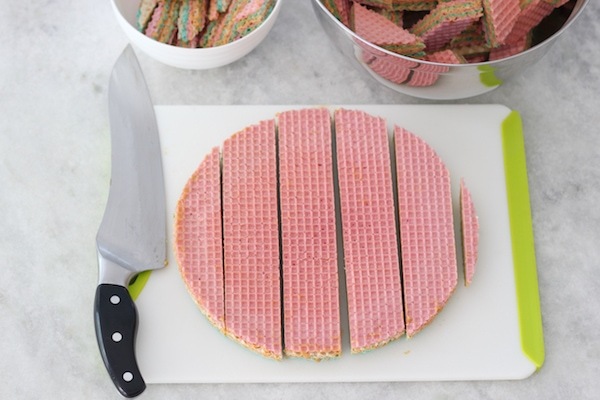 I remember my Mom actually baking the wafer layers herself when I was a little girl, but the store bought wafers make this so much more convenient. 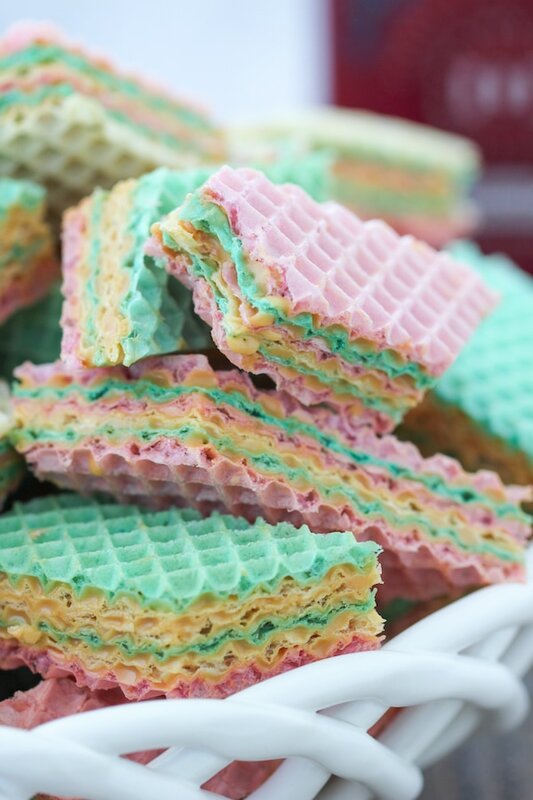 We cut the waffle cake into different shapes and they become little cookies or pastries. Even though the Vafli, as we call them in Russian, are so common at any Russian party, wedding or holiday, they still disappear and are always appreciated:). 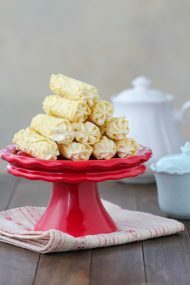 Even if you grew up making this sweet treat, I have a secret ingredient in the filling that I’m sharing today that my Mom discovered – cream cheese in addition to the dulce de leche and butter. 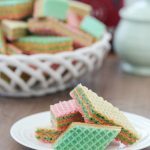 The cream cheese makes the filling less sweet, makes the wafers softer and most people who try them, always comment that they love this version. 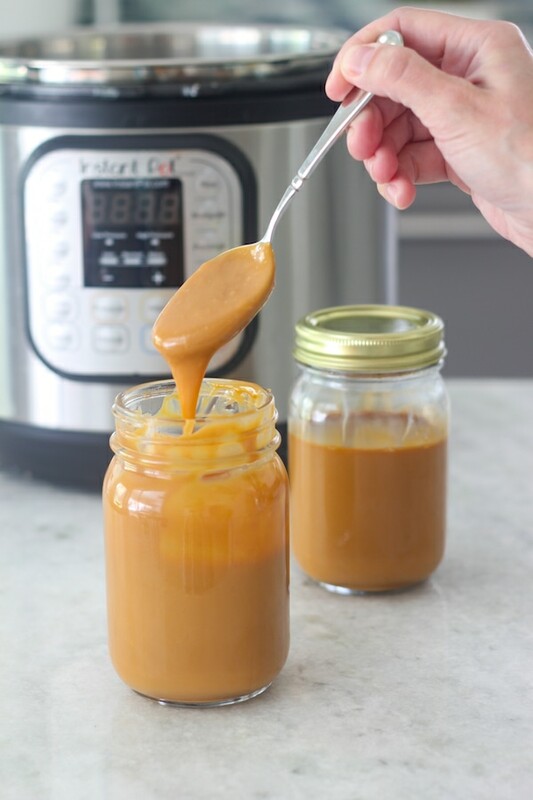 Store bought dulce de leche is available in many stores nowadays, but you can easily make your own dulce de leche by cooking sweetened condensed milk on the stovetop, in the slow cooker or in the Instant Pot. 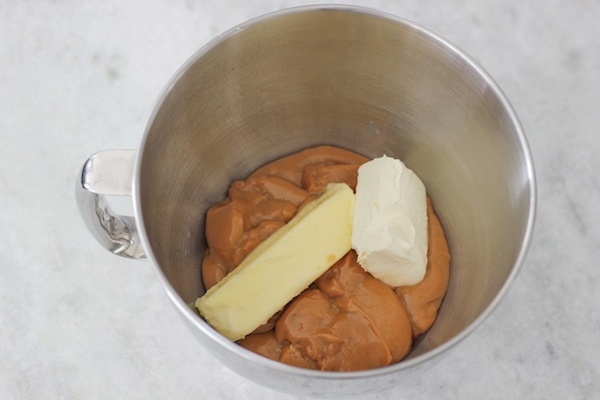 Today I will share the Instant Pot recipe for dulce de leche – my personal favorite. You can buy dulce de leche in some stores, but if it’s not available where you live, you can cook it yourself. If you have an Instant Pot, it takes just 35 minutes to cook it into a rich and creamy consistency. Pour the sweetened condensed milk into a glass mason jar. I used 1 pint sized jar for each can. Close the lids. 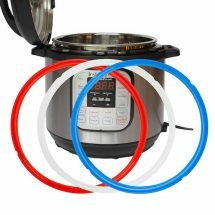 Place the jars into the inner chamber of the Instant Pot, putting them on top of the steaming rack that comes with the Instant Pot when you purchase it. Fill the entire inner chamber with water, so that it reaches all the way to the top of the lids of the jars filled with the sweetened condensed milk. Cook on manual high pressure for 35 minutes. Wait for 5 minutes and then manually release the pressure. Take out the jars out of the water, but be really careful, because they will be really hot. Use canning jar tongs to take them out. Cool completely. Meanwhile, bring the butter and cream cheese to room temperature. 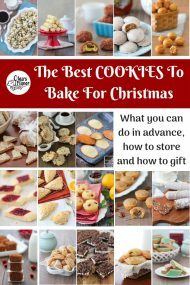 If you mix them cold with the dulce de leche, you will have small flecks of butter and cream cheese throughout the mixture, instead of getting a really smooth consistency. 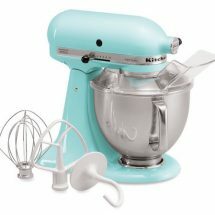 When the dulce de leche is completely cool, use a hand mixer or a standing mixer to mix it with the butter and cream cheese. If you prefer the waffle cake to be more crisp in texture, omit the cream cheese, and only use the dulce de leche, butter and vanilla. Add vanilla extract for flavor. You can also use a 1/2 – 1 teaspoon of brandy, rum, cognac or whiskey for an additional boost of flavor, but that is completely optional. Spread a thin layer of the dulce de leche mixture over the top of the wafer, scraping off the excess with the side of your offset spatula. 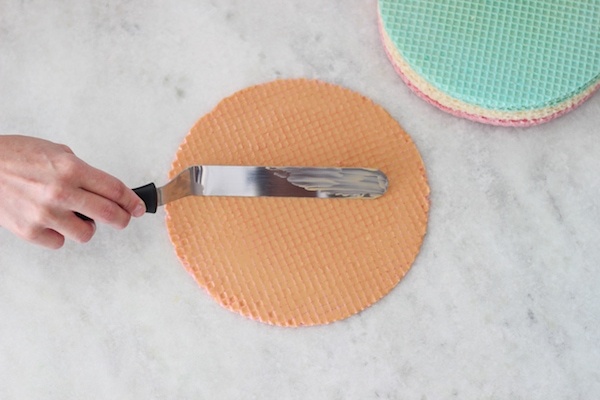 Press the next wafer layer on top of the frosted layer, just like icing a cake. Repeat until you use 6 wafer layers, leaving the top unfrosted. When you have spread the dulce de leche filling over all the wafers, you will have 3 “wafer cakes”. 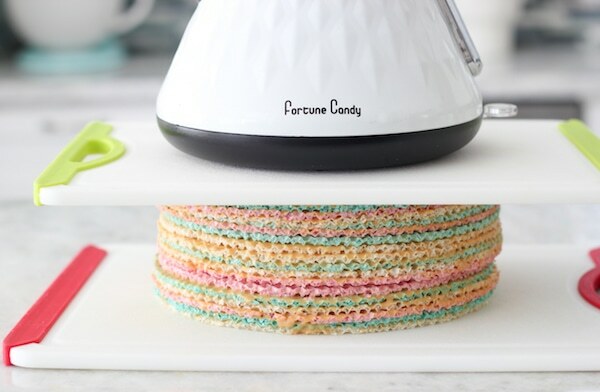 Place the 3 wafer “cakes” on top of each other top, and place a weight over top of them for a few hours. 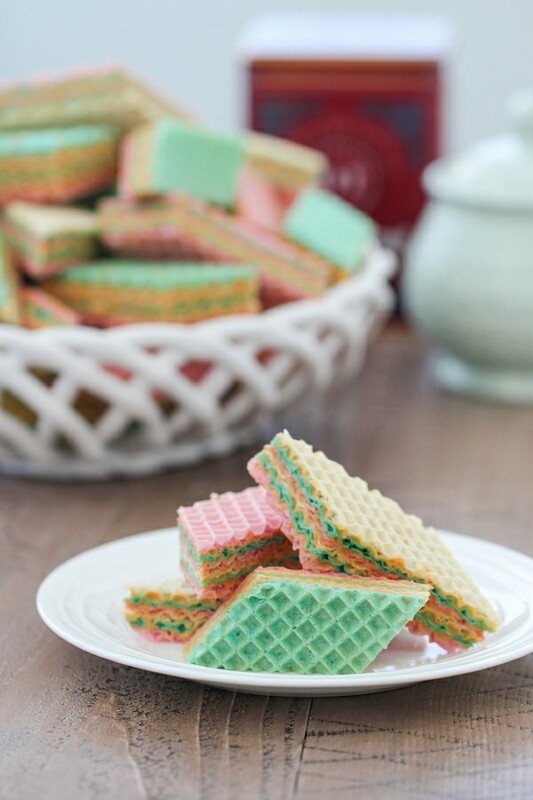 Cut the wafer cakes into different shapes – you can do triangles, rhombuses, rectangles or squares. 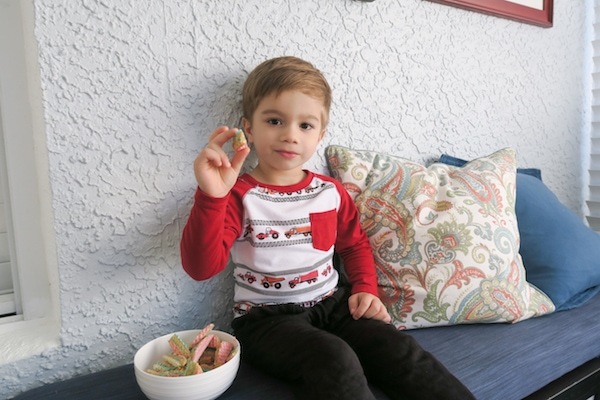 As I cut the cookies, I always even out the edges to make them straight, so I end up with a bowl of scraps, which is just a treat for the cook – OR any little helpers who happen to be nearby. 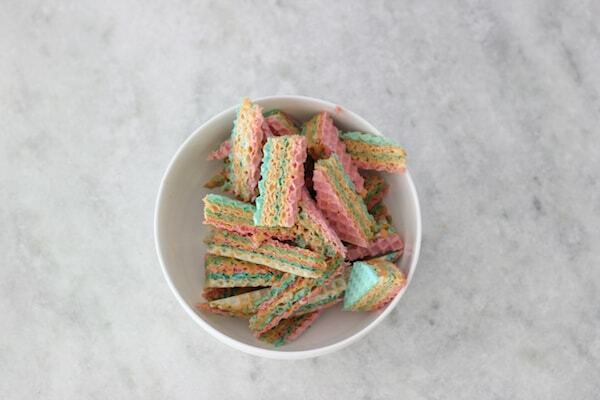 Store the wafer cookies at room temperature, covered, up to a week. 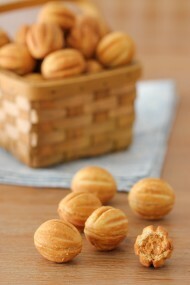 You can also freeze them very well wrapped or in an airtight container for up to 3 months. If you have an Instant Pot, it takes just 35 minutes to cook it into a rich and creamy consistency. 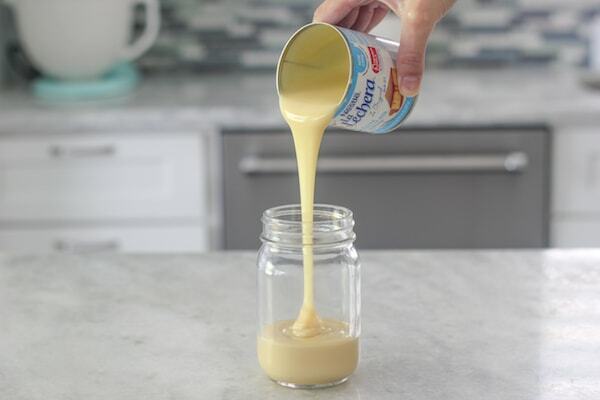 Pour the sweetened condensed milk into a glass mason jar. I used a 1 pint sized jar for each can. Close the lids. 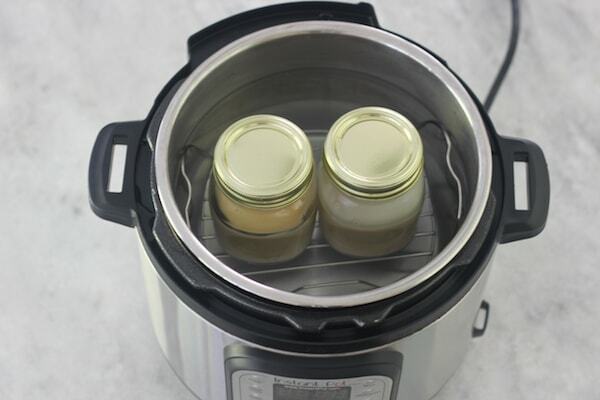 Place the jars into the inner chamber of the Instant Pot, putting them on top of the steaming rack that comes with the Instant Pot when you purchase it. Fill the entire inner chamber with water, so that it reaches all the way to the top of the lids of the jars filled with the sweetened condensed milk. Cook on manual high pressure for 35 minutes. Wait for 5 minutes and then manually release the pressure. Take out the jars out of the water, but be really careful, because they will be really hot. Use canning jar tongs to take them out. Cool completely. 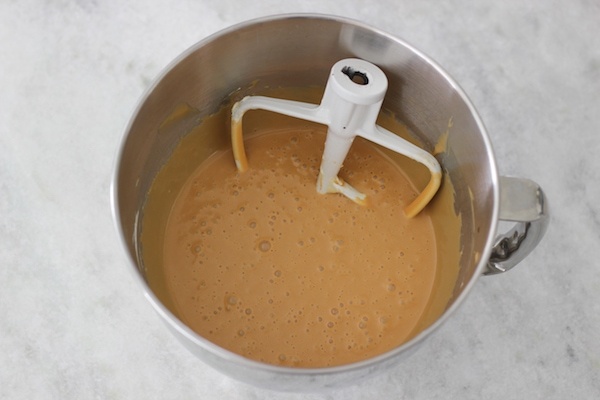 When the dulce de leche is completely cool, use a hand mixer or a standing mixer to mix it with the butter and cream cheese. Add vanilla extract for flavor. You can also use a 1/2 – 1 teaspoon of brandy, rum, cognac or whiskey for an additional boost of flavor, but that is completely optional. 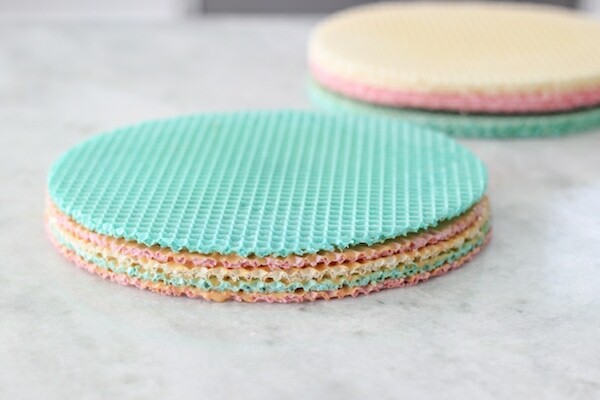 When you have spread the dulce de leche filling over all the wafers, you will have 3 “wafer cakes”. 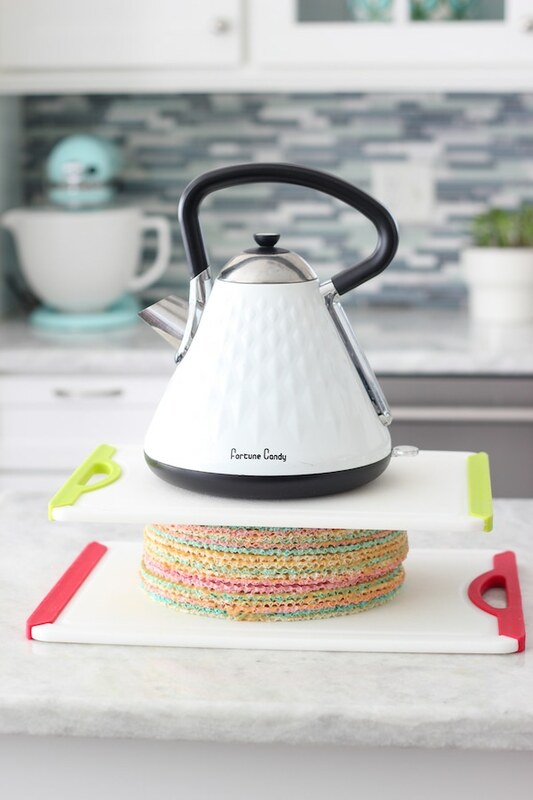 Place the 3 wafer “cakes” on top of each other top, and place a weight over top of them for a few hours. 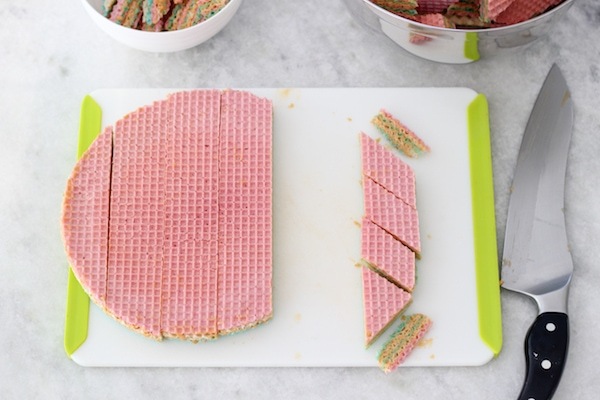 Cut the wafer cakes into different shapes – you can do triangles, rhombuses, rectangles or squares. I am wondering if the ounce measurement for the 1/4 cup of cream cheese should be 2 ounces? It should be 4 oz, 1/2 cup cream cheese. 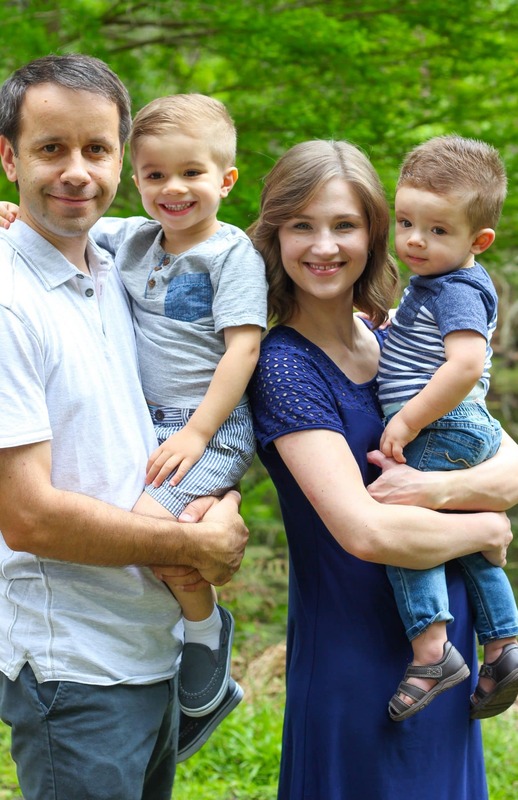 These are my kid’s favorite! They also love when I add some nutella, I just alternate layers with dolce de leche and nutella. That’s a great idea, Olya:). The dulce de leche turned out amazing in the instant pot. I was hesitant at first but will only make it like this from now on. Thank you. Happy New Year. That’s great, Sveta! 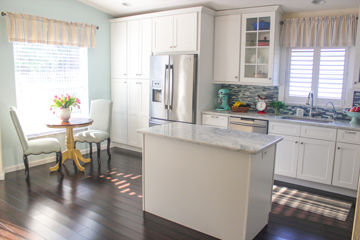 So happy you were pleased with the results. 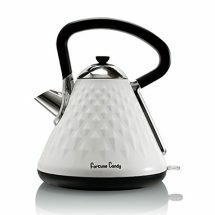 I have question regarding the Dulche de Leche cooking in the instant pot. From your description I understood that you fully cover the jars filled with condensed milk with water. Correct? 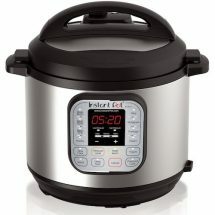 Also, I would be hesitant manually release the steam and open the instant pot right after cooking. Why can’t we wait till the steam will be released and and the jars cool completely inside? I don’t completely cover the jars with water, just fill it to the edge where the lid starts. You just need to have the part of the jar that has the sweetened condensed milk filled to that level. I just waited for 5 minutes to release the pressure. 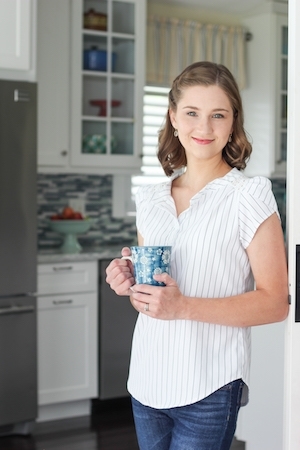 If you wait longer, you should probably cook it less because the sweetened condensed milk will continue to cook even when it’s already turned off. 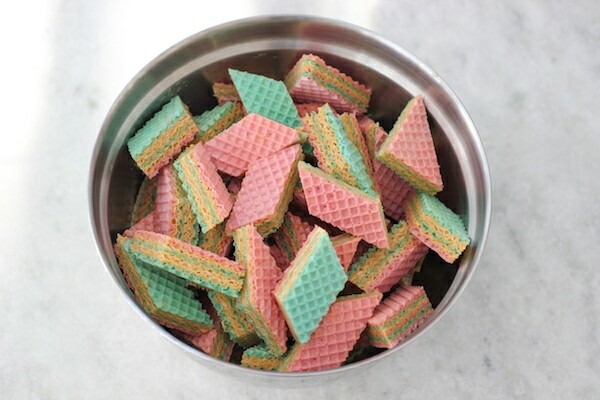 Where do you find those wafers? I live in a very small town and don’t have ready access to large supermarkets. 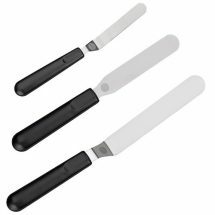 I buy them in a local European store, either Polish or Russian. If you don’t have one, check online. 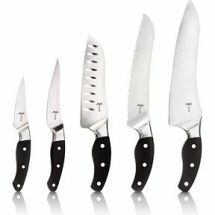 It’s much more expensive online, but I know some readers were able to find them on Amazon.